When water is withdrawn from concrete mass stored in the unsaturated air, drying shrinkage is occurred. This is a consequence of moisture movement, a part of which is reversible due to altering of wet and dry condition.Some portion is irreversible and clear distinguishing is required. For this we have to learn about mechanism of shrinkage. The simple relation of change in volume with removal of water is not valid here i.e. volume change is not equal to removal volume of water. The early loss of free water doesn’t result shrinkage, if any, is very small. When drying continues, water adsorbed in hydrated cement paste is continued to remove. At this stage, the unrestrained paste loss its volume equal to (aprox.) loss of water layer having thickness of one molecular space from surface of gel particles as a whole. Water molecule has thickness is considered as 1% of particles size of gel which indicates a linear dimension change of cement paste upon complete drying. The actual value observed was up to 400 X 10-6 but theoretically these may be 10000 X 10-6. But specific surface of cement paste cured by high pressure steam is low; the microcrystalline structure suffer lesser shrinkage of (5~10) times than normally cured cement paste. Sometimes 17 times less shrinkage are observed. The coarse natural stone shows less drying shrinkage relative to fine grained stone, which is the example of influence of gel particles on drying. We can relate shrinkage or fraction of it with removal of water from intercrystalline structure. It is found to change of space between lattice of hydrate of calcium silicate from (1.4~0.9) nanometer on drying. Hydrated tetra calcium aluminate & calcium sulfo-aluminate also show identical behavior but at different extent. Thus we are not sure that whether intra-or-intercrystalline moisture movement produces shrinkage. But as both Portland cement and high-alumina cement, sometimes pure ground granulated calcium mono aluminate also used to make paste and all exhibit similar behavior especially in shrinkage, the basic cause behind shrinkage should be considered due to physical structure rather than due to mineralogical and chemical character. A relation between shrinkage and mass of lost water are shown in Figure.1. In case of neat cement paste, shrinkage is proportional to water loss as there has no capillary water within the paste, only water adsorbed is removed. However, when pulverized silica is added to mix and to which high water/cement ratio is required (to have greater workability), it has capillary pores (even after complete hydration). Capillary water is important as this water don’t result shrinkage after removal. After removal of capillary water, adsorbed water is removed. 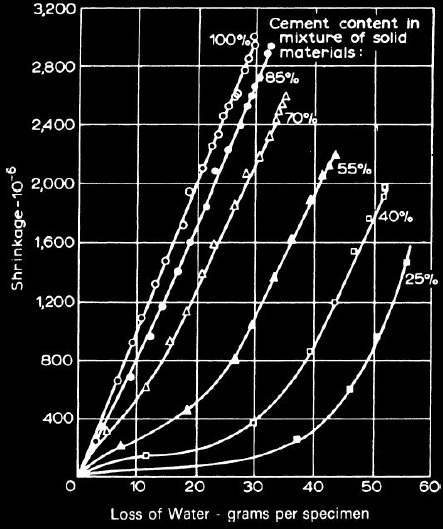 When adsorbed water is removed, shrinkage is taken place as in the case of neat cement paste which is represented by final slope of every curves in Figure 1.When aggregates added to concrete having some water in their pores with large cavities, even more variation in shape of curves are observed in shrinkage Vs water loss plot. Loss of water also depends on sample size. In concrete specimens, Mensi et al. developed a general pattern of water loss with variation of distance from surface at which drying starts. He made an assumption that diffusion rate of vapor have proportionality relation with √t1,( t1=time elapsed). They recommended that the relationship between cylinder of diameter D1 and elapsed time t1 is similar to the cylinder of diameter kD1 and k2t1. In actual concrete members, having full size, situation is not as simple as there have different edges. 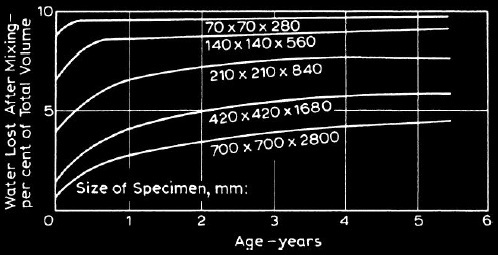 Figure 2 shows such relation for different sizes of specimens. 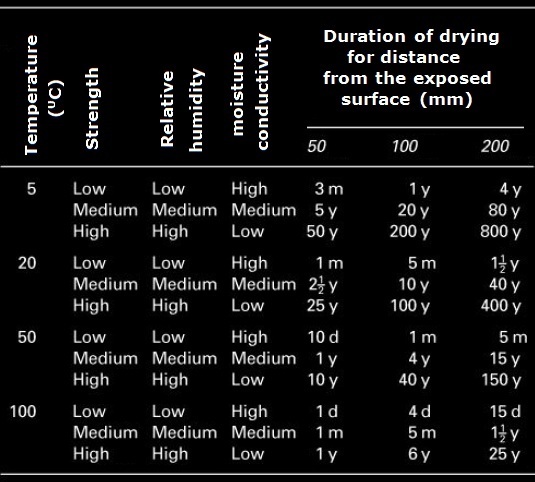 In following table time required to dry concrete from different distance from surface to loss evaporable water (80% removal) are listed. In interpreting data for calculating water loss due to shrinkage, there have further complication with formation of surface cracking on specimen. In laboratory condition small specimens have less surface cracking. In full size concrete members, actual surface cracking obviously affects effective shrinkage. There have also internal redistribution of stresses; cracking also possibly increase rate of water loss.